From the age of Vikings through to the World War II resistance, the rich history of Denmark is encapsulated in fascinating collections of artefacts housed in a series of museums in and around Copenhagen. 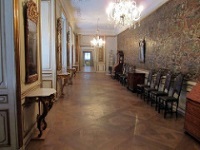 The Prince's Palace in the city centre houses the National Museum, covering Danish history in general with its international antiquities. A few miles north of the city, the open air museum makes for a fascinating excursion. Spread over 86 acres, its 100 or so historic buildings are built to illustrate and represent regions and time periods across Denmark. Visitors can get up to date on the history of the city itself at the Museum of Copenhagen. Visitors should note that the exhibitions at the Museum of Copenhagen are closed until 2019 when the museum reopens in the city centre. Opening times: Copenhagen City Museum: 10am to 5pm daily. National Museum: Tuesday to Sunday 10am to 5pm. Open Air Museum: Tuesday to Sunday 10am to 4pm (May to October). Admission: Copenhagen City Museum: DKK 20 (adults), children under 18 free; Fridays free for all. National Museum: DKK 95. Open Air Museum: Free.